Ah, Belly Dance. So many things come to mind when you hear that word. It means a lot of different things to a lot of different people. 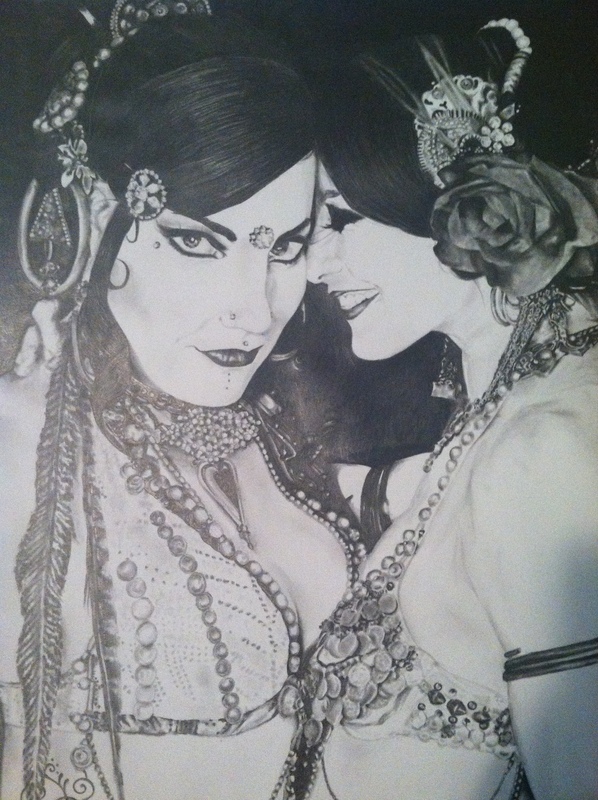 I don’t want to get into the dance itself (as that would be an entirely different blog and there are already many excellent belly dance bloggers in the world), but rather, how belly dance has inspired my own artwork. This past year almost every single one of my pieces has been inspired by belly dance (and before you go thinking, wow, that’s kind of weird, please note that I’ve been belly dancing since I was sixteen, and it is one of my day jobs). All the women and men (yes, men) that I’ve met through dance are beautiful and strong. On stage, they perform with passion and grace, some pushing the boundaries of the dance and others keeping traditions alive and reminding belly dancers why they dance in the first place. This strength and independence I see on stage is always the spirit behind the figures in my artwork. Costuming is another inspiring aspect of belly dance. The costuming in belly dance is unbelievable, especially in Tribal fusion belly dance, as it is a fusion of many dance styles. This means dancers could take costuming pieces from almost any culture they wished to form something new and interesting. I’ve seen astounding use of colors, jewels, headpieces and crowns, and makeup. The intricate jewelry I find particularly fascinating. The photo at the top of this post is one that I did about five years ago, as practice drawing faces and jewelry. All credit should go to Pixie Vision Productions, and the two models, Zoe Jakes and Rachel Brice. Looking at the piece now, I can see what needs improvement. Nothing is ever perfect. But this piece taught me a lot about detail. The way these ladies decorate themselves is extraordinary and it was a privilege to try to recreate all the buttons, feathers, flowers, crystals, etc. that they were wearing for that shoot. I’ve always been detail oriented, but the detail that goes into costuming and creating a dance comes out in my visual art, and I have belly dance to thank for that, and the hundreds of belly dancers that are just amazing in what they create and perform. This is just a short post (I could go on and on about the dance, what it means to me, and so on and so forth), but I just wanted to give a shout out to the art form that keeps inspiring me to create.